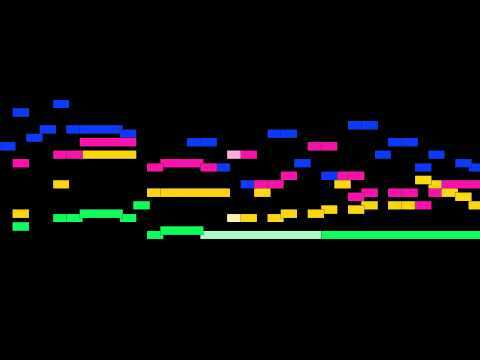 Minuet in A flat major for string quartet, Hess 33, by Ludwig van Beethoven, with animated score. FAQ: Q: Who is Ludwig van Beethoven? A: A German composer and pianist, crucial in the transition between the Classical and Romantic eras. You can read more about him here: http://en.wikipedia.org Q: What do the colors mean? A: Each color represents a different instrument, or a different part of another instrument. Q: How did you make this animation? A: With a program I wrote in Python. I also used FFMPEG, SoX, TiMidity, FluidSynth, Python Image Library, and midicsv. All excellent, free, open-source software. Q: Could you make a video of this other song? A: Sure! Well, maybe. For copyright reasons, it has to be public domain music. Just comment below, or send me a message and I'll see what I can do.